The perfect finishing touch for your elegant affair, adorn your event tables with our Silver Fleur De Lis Place Card Holders. 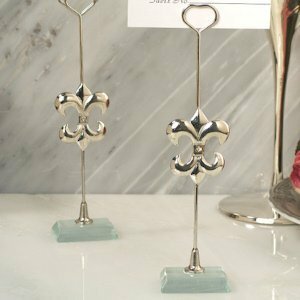 Each place card holder features a solid Fleur de lis design attached to a metal stick holder seated on a crystal glass base. You can use them to seat your guests or hold photos of the guests of honor. Your friends and family will enjoy bringing one home to display a cherished photo of their own. Each place card holder measures 4.5" high. How tall are the card placement stands? The Silver Fleur De Lis Place Card Holder measures 4.5" high. 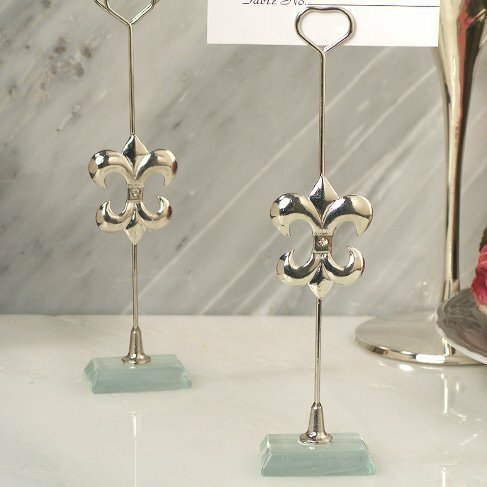 Each place card holder features a solid Fleur de lis design attached to a metal stick holder seated on a crystal glass base. Do these place card holders come in taller sizes? I'm sorry, that's the only size for the Silver Fleur De Lis Place Card Holder. Each place card holder measures 4.5" high.